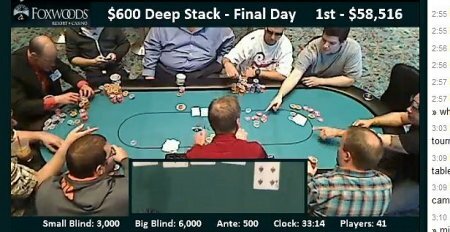 I was watching the live stream of the $600 Deep Stack being played at Foxwoods Saturday and Sunday, March 17 – 18, 2012. On Saturday, there was a man at the table who was drunk. He refused to stack his chips. The other players complained and mostly, nothing was done. He delayed the game a lot by not putting in his antes and blinds. The dealer would have to ask him twice for the antes, and, bang the table two or three time for his blinds… every hand, every round. Oh – he would get on the phone and get up and walk away from the table. The other players were visibly upset and voiced their objections. 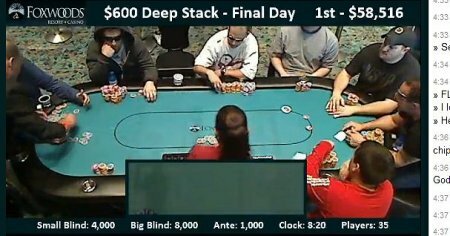 The players on either side of him kept putting in his blinds and antes in order to speed the game up. The floor had no response. I watched the other players exasperated for two hours. Then it occurred to me that this is epic. 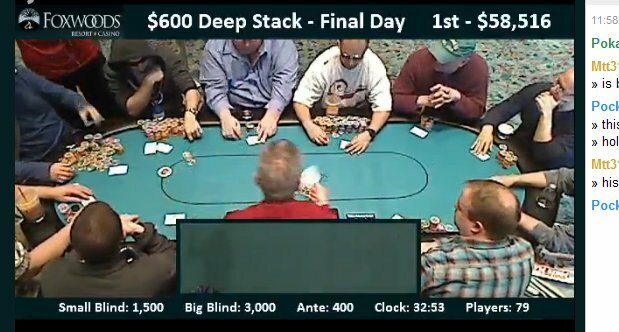 At 12:10 am, seat 2 has added cash - dollar bills, prescription bottles, and whatever else he had in his pocket to the table. 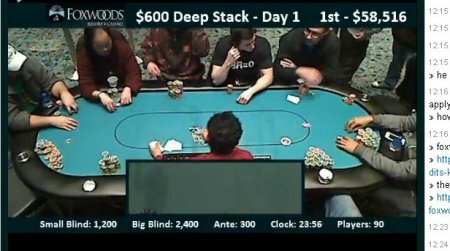 The guy returned, apparently sober and was at the featured table in seat 3. His behavior was exactly the same. Sloppy stacks. Slow action with the antes and the blinds. 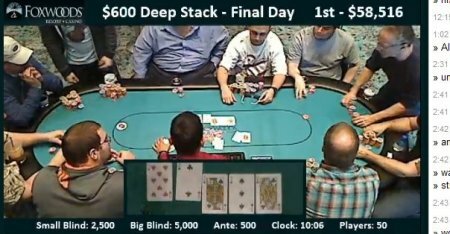 Both players on either side reaching over to get the correct amount of chips. He was talking on the phone. Got up and walked away during live play 2 or 3 three times and then wanted to play his hand. Called a guy’s All In, then changed his mind. When the floor came over, he ruled that he hadn’t called. (In fact, he had said it twice…). 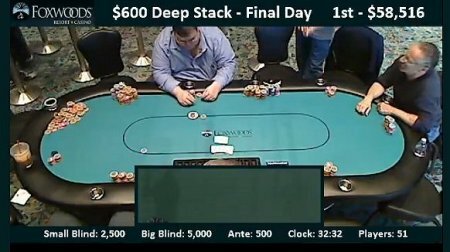 At about 4:45pm, players redrew and seat 3 was moved to another table. There’s even an 800 number to call and make reservations. I don’t know how they do it giving all that for $35, but, I’m glad…more money in my pocket for playing poker at Foxwoods’ no limit hold em tables. It’ll be great to play at Foxwoods again and update the poker room review. Plus…Sounds like a quick and easy gifting idea for the Holidays! Saturday, Oct. 3, 2009 I went to Mohegan Sun in Uncasville, CT with a group on a casino excursion arranged by a local travel agency, Travel by Tatten. Turned out to be very nice. So easy to drive to a local hotel and board a luxury bus. It had been raining heavy off and all on day, so, it was great to leave the driving to someone else. I played at a $1/2 no limit hold’em table. When I arrived at the Poker Room, I asked how long the wait was and the Board Person said that I could be seated right away… and I was. I asked how many $1/$2 no limit hold’em tables Mohegan Sun had going that evening and she answered 10. So, approximately 24% of the Poker Room’s tables (10 out of 42) were running $1/$2 no limit hold’em games. The Poker Room was very busy and abuzz with activity. Chips were chattering with nervous energy. Every few minutes the cheer from a big beat could be heard; balanced several minutes later with an anguished groan from a bad beat. Minimum buy in for a $1/$2 table is $60; max is $300. I had brought $200 to play. In the past, I would buy $100 in chips at a time regardless of the total amount that I had allocated for the session. Since January, I have been doing a lot of reading and research for this website, and learned that it is better to purchase all the chips at once and go to the table with your larger stack than it is to go with $100 in chips and refill as needed. So, what did I do? At the last moment, I purchased $100 in chips. Huh? Guess I was not really committed to playing $200. At my end of the table (I was in seat 10), were 4 players who were pretty chummy. Two seemed to know each other well and apparently run into each other every Saturday night when they come to play (and take advantage of) the occasional, less-experienced live players like myself. All four were good players. 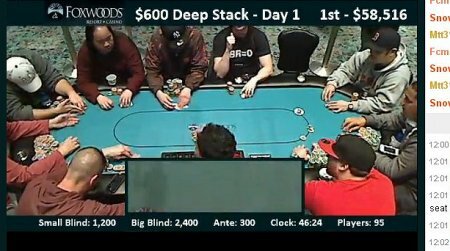 They spent a lot of time talking about and criticizing the player in seat 3. You know him. You’ve seen him, and probably played at a table with him. A Poker Pro wanna-be… Sunglasses, baseball cap, long pauses, tried to talk like he knew what he was doing. He didn’t have a clue – and – the four around me were on to him and chomping at the bit to bust him. Problem was, he was drawing great. I played for about 2.5 hours at the same table. I folded a lot pre-flop, and won the majority of the hands I played. I lost one big hand in which I had invested about $57. At showdown I had trip Aces. The other player made a Full House. I was focused on the potential wheel and hadn’t even considered that. He had a pr 3’s in his hand. I left with $48; down $52 and $7 of that was for tips. For as busy as it was, the noise level was pretty normal. It is a no smoking poker room. Although you can smoke all around it, the room is somewhat closed off, so, it is much less smoky than other parts of the casino. The Board person was friendly and efficient and had me seated in less than 2 minutes. Floor personnel managed table turn over very well and empty seats were quickly filled at all the tables around me. The dealers changed every half hour. Each was experienced, friendly, and kept the play moving at a good pace. Overall they were very good. There were a couple of goofs…One dealer misdealt which she recognized immediately and re-dealt. Another dealer forgot to deal me in one hand. (I was in seat 10 talking to the player in seat 9). 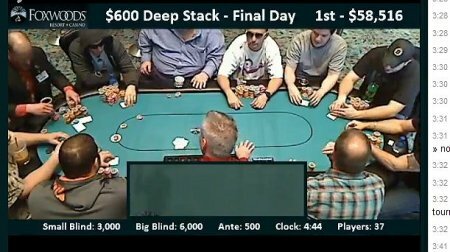 It was interesting because it wasn’t the first hand he had dealt and there was no player movement (coming or going) at my end of the table. He simply skipped over me. No problem. The dealers were moving really fast and these incidents were a blip in time. We were off playing again in short order. This experience with the dealers at Mohegan Sun was very much more positive than my experience with the dealers at Mohegan Sun back in April. I took some flyers in order to share tournament info with you here, but, today, I went to the website to double check on something, and realized that they are doing a much better job of posting information about the Poker Room tournaments online, so, no need to duplicate. Here’s a link: Mohegan Sun Poker Room Tournaments. A friend told me about this trip to Mohegan Sun for Saturday, October 3rd. Looks like an awesome deal, so, I booked myself a seat. Can’t get much simpler. Round trip travel by bus from Marlborough to Mohegan Sun and back. Get a dinner buffet worth $22.00 and a $15.00 Keno voucher. Never played Keno, but, I’ve eaten at their bufffet and it was great. Value is $37.00 – and – cost is only $35.00 per person. I love deals like this! No worries; no having to hassle with driving. Just get on the bus and let the driver handle the transportation. I can focus on fun! I look forward to playing in the Mohegan Sun poker room and practicing what I have been learning through reading and playing no limit hold’em tournaments these past couple of weeks with the EPT. Note: It says book by Sept. 12th, but, I called anyway and registered. I believe she said that seats are available. If you’re in the Marlborough, MA area, check it out. Planning your trip to Las Vegas? Wondering where to play? Well, you could Google “poker room reviews“. You could go to poker forums and search those for poker room reviews – or – you could save yourself tons of time and go to Michael Hamai’s All Vegas Poker. I’ve been following Michael on Twitter since the start of the 2009 WSOP. He plays poker in Vegas everyday. And when he is done playing the day shift, he meets up with his wife, and together, they head out for the night shift. Michael does a great job of keeping the information for each poker room up to date. There is information on the size of the Poker Room, the games played (limit, no limit, omaha, etc. ), the limits, minimum buy ins, maximum buy ins, tournaments, tournament days and times. Michael rates each poker room and writes a review. What adds even more value to this Las Vegas poker room review website is that visitors are allowed to leave their own reviews, so you get a very un-biased picture. Know other websites that should be recommended? Leave a comment and I’ll research and add them. I was upset that my information continued to be posted at those rogue poker sites, so, I stopped playing sit-n-go’s at PokerStars for a while. Played a lot of freerolls. Then a friend asked me to see a show at Mohegan Sun. The tickets were free. The catch is that in order to get good seats, you have to arrive around noontime to pick up your tickets. The show didn’t start until 8:00 p.m. … Hmmmm. What to do with all that time? So, I played for the first time in the Mohegan Sun Poker Room. It was pretty nice, a good amount of room, and the employees were nice and kept things orderly. I bought in for $100 at the first table. Sat out until it was my blind. The players were pretty tight, but, things were going okay. Then it was my second big blind. Cards were dealt and players were calling, raising or folding. The dealer turned to the button to see what she was going to do. At the same time, a woman (employee cleaning up) tapped me on the shoulder and asked me about some stuff that was on the floor under a chair to my left that had just been vacated. When I turned back around, I see the flop had been dealt and the dealer was turning to the small blind. Huh? He didn’t even ask for my option. I said “Wait, I didn’t even get my option.” [ I was going to raise. Had a lousy K 5 clubs, but, the way the action was going, I wanted to raise the others out.] He apologized, and said he assumed I was calling, and asked me what I would have done. Raise, I said. So, then he had to call someone over to confirm what to do next and to witness the action. He explained to the other person it was his fault… which I appreciated because I was feeling like a creep – everyone at the table is staring at me like I did something wrong. So, the hand gets delayed and there is a discussion amongst the workers They decide what to do, but, then decide to get another person’s blessing. So we wait another few minutes for someone else to come over. The three confer and one stays to witness the rest of the hand. I got up and took a stroll to walk it off. When I came back, I was still unsettled. I played for about another 20 minutes and got into a hand with the same player as the confusing hand. I had a straight on the flop and checked. He checked. I called him all in on the turn and he complained, but, called. He called all his chips with 2 pair, staring at a possible straight on the board. A 6 on the river gave him a full house. He was playing 9 6 offsuit. I’m filing this under Poker Rooms even though a lot is about my, PokaPaloma’s, experience. Think it is important to know how the room is run and the quality of the dealers. The Poker Room is located in a whole new section of the casino called Casino of the Wind. It has its own restaurants, shops and bays of slot machines. There is a full-wall, floor-to-ceiling waterfall (water wall) at the end of this new area. Colored lights dance across the wall to create a soothing backdrop to the frenetic sounds of the casino. For me, the water wall helps take the edge off of the constant pinging and sirens. Good for gathering your thoughts before sitting down to play Texas Hold’em. The poker room is on the right side almost at the very end of the new area, so, look for the water wall and head all the way back and you’ll see Mohegan Sun’s poker room on the right. There is a large Poker Room sign over the entranceway. (See rendition of Mohegan Sun’s Poker Room. Click Poker Room on the red strip on the left.) The room holds 42 tables. It was Saturday and at 11:30 a.m. there were few tables – maybe seven- in use. There was a waiting list for almost all the games. 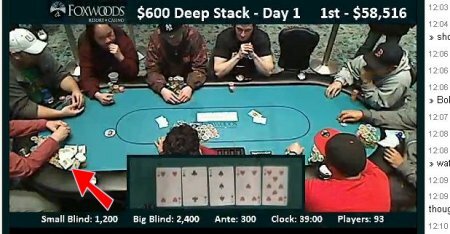 When I returned to the poker room at 2:00 p.m., twice the number of tables were in use and seating was immediately availabile at a $1/$2 Texas Hold’em table ($60 minimum to play). This day, there was a tournament that started at 9 a.m. and Sit N Go Tournaments were run throughout the day. Playing at a table was not an option for me on this day, so, I picked up a poker tournament schedule (January & Febraury 2009) to see when I might return. Daily poker tournaments, Monday – Friday are at 9:00 a.m., Noon, and 7:30 p.m. The weekend schedule varies. Most Saturdays and Sundays there is a 9:00 a.m. tournament. You’ll want to check Mohegan Sun’s Poker Tournament schedule for the most current information. Along with the daily tournaments, there are a lot of Satelite Qualifiers and Bounty Tournaments, as well as Ladies Only Poker Tournaments. Have you played in Mohegan Sun’s poker room? What are the dealers like? I’d be interested in learning about the skill level of the dealers. I’ve played in Casinos where the players were very much more knowledgeable and faster to conclude the winner. It is painful to sit by while a novice dealer walks through the thought process to declare the winner. Even more painful when they consult the “cheat sheet” to see which hands beats another. Yes, I played at a table where that actually happened…Scary!